The recent visit of South Korea's President Lee Myung Bak to Moscow has sparked a groundbreaking change in the geoeconomic relationships in the Asia-Pacific region. When this conservative politician, after six-year tenure of Mayor of Seoul, won the national elections in December 2007, most of analysts interpreted his success as a sign of consolidation of US policy on the Korean peninsula. It is true that Li Myung Bak promised to pursue a harsh policy towards Pyongyang and to suspend withdrawal of the US contingent from South Korea. At the same time, Li Myung Bak advertised a highly ambitious economic strategy, promising a double increase of income per capita and elevation of South Korea to the level of a top-level economy. Today, it is becoming clear that the considerations of economic expediency and profitability are the highest priority for this politician. Unlike Japan that fully shared the US approach in the conflict between Georgia and its breakaway territories, South Korea displayed neutrality in this issue, thus making a positive gesture towards Russia. Seoul is pursuing development of strong economic ties with Moscow, and the results of the summit talks were beyond expectation. Seoul's commitment to purchase an annual amount of 10 billion cub. m of Sakhalin gas since 2015 is most significant. It is noteworthy that the "blue fuel" is going to be transported along the trans-Korean pipeline, i.e. across the hostile North Korea. The construction of the pipeline link is going to play both an economic and geopolitical role, promoting the process of Korea's reunification. 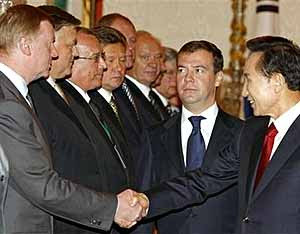 The agreement, signed with Seoul, is of great importance for Russia as well. It delivers a distinct message to European consumers of Russian gas that have extensively discussed the necessity to reduce energy dependence from Russia. Thus, Moscow demonstrates its ability to diversify exports in case European partners succeed in diversification of energy imports. A breakthrough is reached also on another direction: one more document dots the i's in the unprecedented project of railroad transportation. Moscow and Seoul have signed an agreement on reconstruction of the Trans-Korean Railroad and on linking it to the Transsiberial Railroad. This plan is going to be implemented within 7 years. According to the estimates of the Far East Railroad Authority and Dalgiprotrans Design Institute, the reconstruction of the Rajin-Tumangan-Khasan section in South Korea will take 5 years and require investments of 10 billion rubles. It is noteworthy that a positive reaction from North Korea is already achieved. The modernization of the railroad will be started at the Russia-North Korea border in Tumangan, simultaneously with construction of a container terminal at the Rajin port. Thus, the railway corridor design, discussed by Moscow, Seoul and Pyongyang in 2007, will materialize. The Russian-North Korean joint venture RasonKonTrans, established a year ago, has signed a 49-year concession agreement with Tonhe, North Korea's state-owned railroad transport company. Improvement of transport of Korean and Japanese goods along this Eurasian route is not the only advantage. Most of the countries of South-Eastern Asia have been lately dependent from South Korean ports. The share of the region's countries in exports to Europe has elevated to 25%. These nations in fact "call the tune" in transcontinental trade. The transcontinental transit of goods is far more advantageous than the use of the traditional sea route via the Indian Ocean, the Red Sea and the Suez Canal, especially regarding the increased activity of Somalian pirates at the entrance into the Red Sea. According to calculations made independently in both Koreas and Malaysia, the transit along the Trans-Korean and Trans-Siberian railroads is by 15% cheaper and by 25% shorter than the traditional route, adding the advantages of security. The competitor is going to become a partner. From South Korean ports, a part of the cargo can be shipped to Europe also via the Chinese-Kazakh railroad link. The trans-Chinese railroad has got connections with the Russian railroad network in four places: in Orenburg Region, Altai Region, Buryat Republic, and Chita Region. Thus, Russia and China acquire new prospects of trade partnership. The energy and transport agreements with Seoul, in case of their practical implementation, are elevating South Korea to the role of the Russian Federation's crucial economic partner in South-Eastern Asia. Given the current frictions with Japan emerging from the unresolved territorial debate, and the inexpediency of excessive economic dependence of East Siberian regions from China, the cooperation with South Korea is providing Russia an opportunity for a more efficient and balanced policy in the Far East.